Goldberg undoubtedly has a much more nuanced appreciation of L’Ambroisie than I was able to form during my single visit (€795). 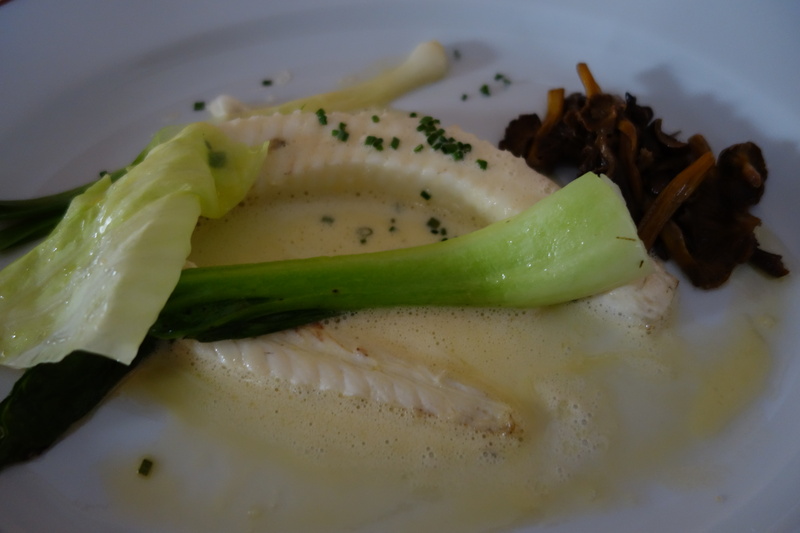 A similar advantage goes to the French journalist who told me this week that he has known chef Yannick Alleno for a long time, that he “knows his cuisine by heart between Cheval Blanc and Ledoyen.” How could one lunch at the latter (€517) give me enough information to draw comparisons? 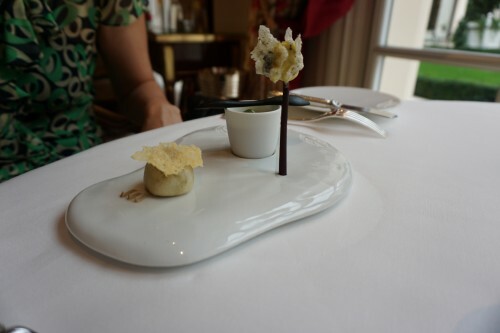 That insecurity plagued me throughout this project, in which I visited every Michelin three-star restaurant in Paris. 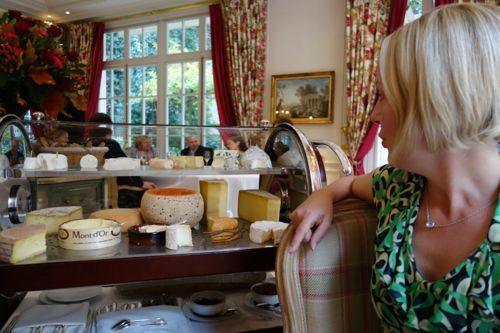 I tried to combat it by remembering that our audience – the readers of Paris by Mouth and the visitors who join our food tours – are not themselves going to return multiple times to L’Ambroisie or Ledoyen. The overwhelming majority cannot afford to do so. Those who can better afford it have plenty of other options now to consider. 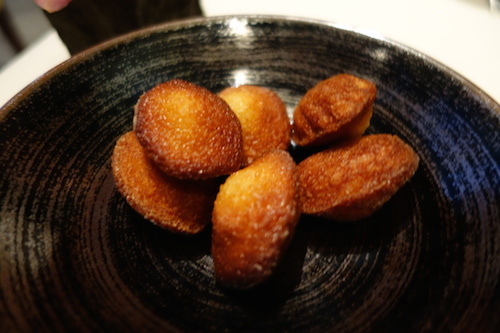 They’d rather try Noma or Mugaritz or Manresa than return to something that didn’t delight the first time around. 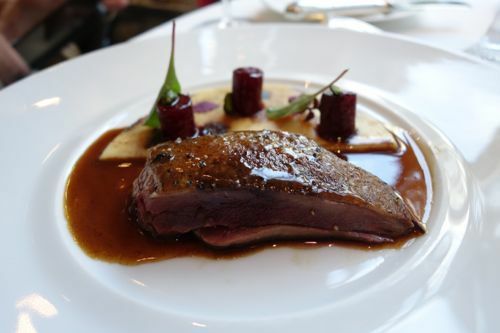 With some exceptions, the existing literature on haute cuisine – reviews published in major newspapers and on blogs – is written by people who don’t feel the sting of l’addition in the way that you or I might be bowled over by a bill. If a writer is not being charged for his meal because of his value as a promotor, or if his wealth affords him freedom from feeling this pain, then there is simply too much distance between his own perception of the meal and what our readers might experience. This is also true at the level of more modestly priced restaurants, but the stakes are different. Disappointment is magnified exponentially when a digit (turning 50 into 500) is added to the total. 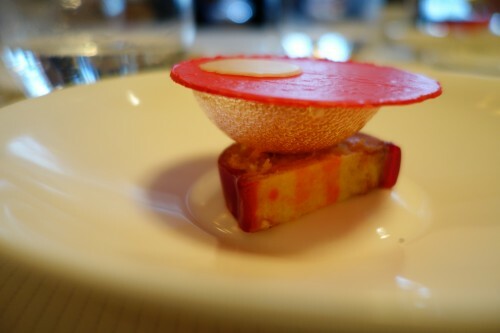 Similarly, if a writer has climbed the entire ladder of a chef’s cuisine, including the special dishes reserved for VIPs and regulars, he may have lost sight of the chef’s starting offer – the lunchtime tasting menu at the bottom rung, the only one that’s reachable for most. We can enjoy these accounts in the context of background reading and armchair traveling, but they don’t help our audience – people who are willing to spend money on food, but who still feel the hurt – decide which one or two experiences to invest in. 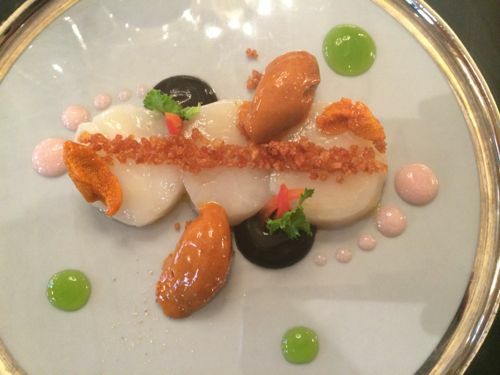 Here are the results of my apprenticeship – three months spent anonymously tasting every three-star and most of the two-star restaurants in Paris. Ultimately, only one of the two-stars was included (as similar, competitive) in the final analysis. 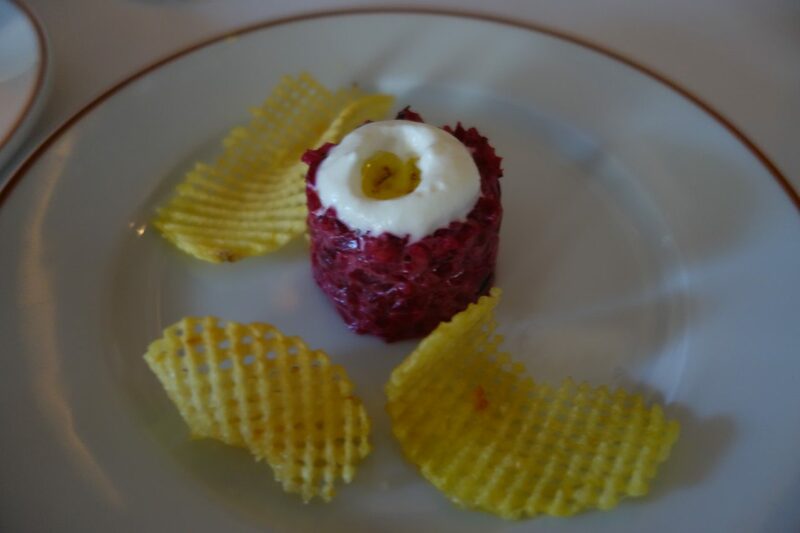 For more information about why we did this, read Behind the Curtain: Examining Haute Cuisine in Paris. This ranking is of course subjective, based on my experience with the lunchtime tasting menu (when one was available) and what matters most to me. While I enjoy a spectacular setting, it’s not more important than the food. 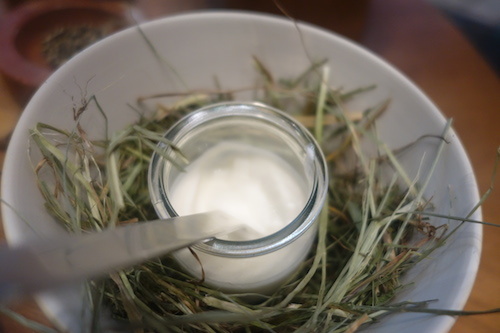 I appreciate luxe ingredients but am more impressed by the elevation of modest materials. I am equally interested in traditional haute cuisine and its more modernist incarnations. I eat everything and drink a lot. I would always prefer to taste a series of thoughtfully paired glasses of wine than to stick to one recommended bottle (invariably a white Burgundy). I don’t need for a chef to come out and shake my hand, but I’d like to know that he’s in the kitchen. I am unmoved and often annoyed by celebrity status and public relations. I am very easily seduced by joyful service. Below, I’ve noted the most salient features of each meal that contributed to this ranking. 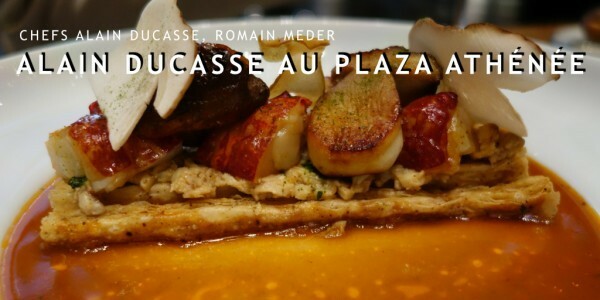 In the coming week, we’ll be posting more detail for each of these restaurants on its page in Our Guide to Paris Restaurants. Understanding that your own opinions will be very different, I hope you’ll share your own personal experiences with these restaurants in the comments. 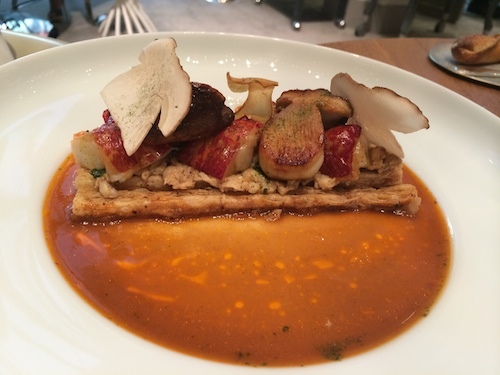 My favorite three-star in Paris is not actually a three-star. Not yet, anyway. 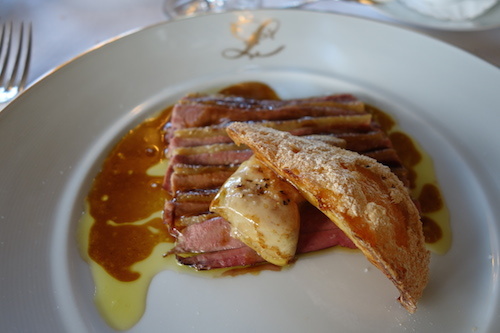 Christian Le Squer was poached from Ledoyen in order to win the elusive third star for Le Cinq. There is a sense of urgency here. He is going for it. 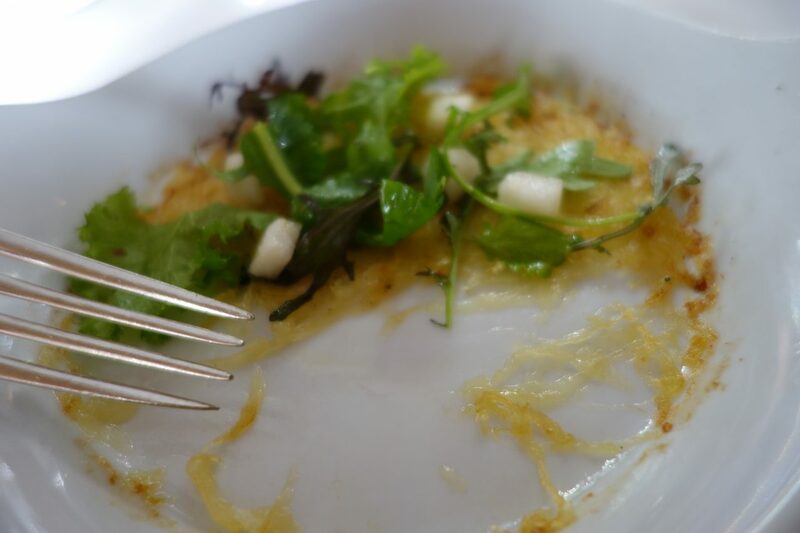 His least dazzling dish delighted me more than any bite from the bottom five restaurants. 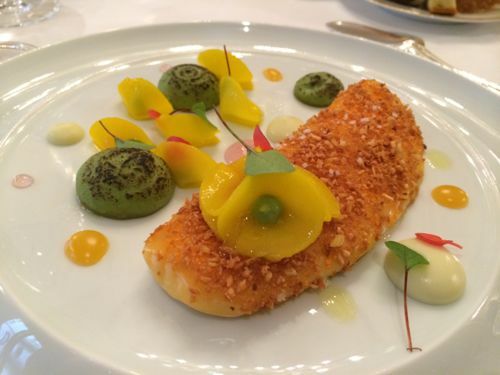 His best offerings dominated our list of The 20 Best Bites in Haute Cuisine. 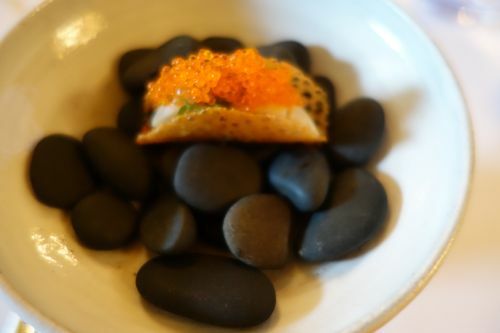 Cuisine: High points included a bracing medley of marinated sea scallops, sea urchin and coral crumble – my favorite among more than 200 dishes tasted during this research. 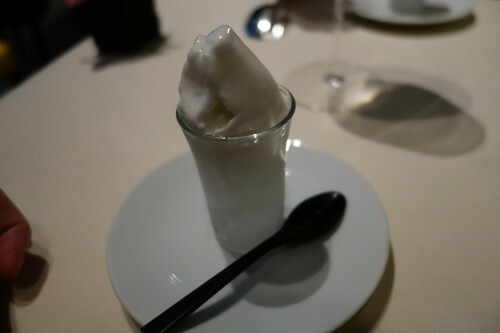 To finish, a daring dessert (pictured above) that brilliantly straddled the line between sweet and savory with flavors of fresh milk and fermenting yeast. The precision and balance Le Squer maintains while attempting such provocative compositions is remarkable. Service & Spectacle: All aspects of the highly formal service, including suggested wine pairings, were flawless. 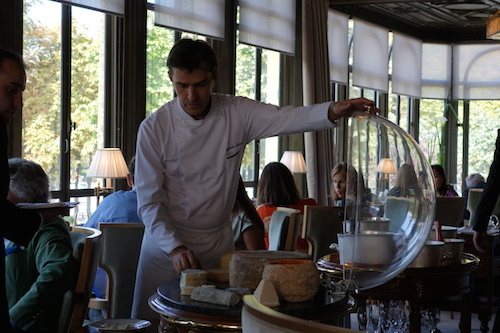 Dishes arrive on silver trays, their domes removed simultaneously by black suited servers. 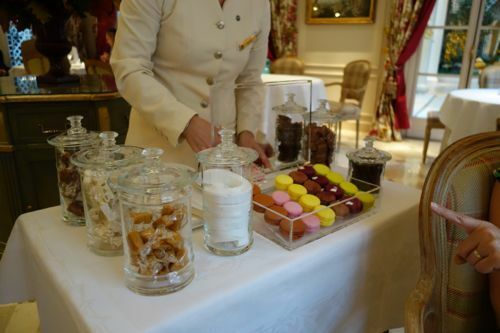 Mignardises are rolled over on a towering cart topped by a chocolate squirrel. 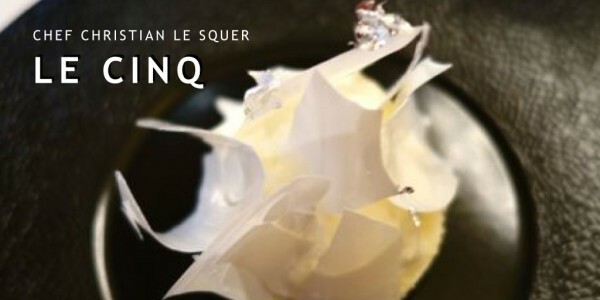 The setting inside the Four Seasons is luxurious if forgettable in the way that international hotel chains tend to be – an elegantly neutral backdrop for Le Squer’s extraordinary cuisine. 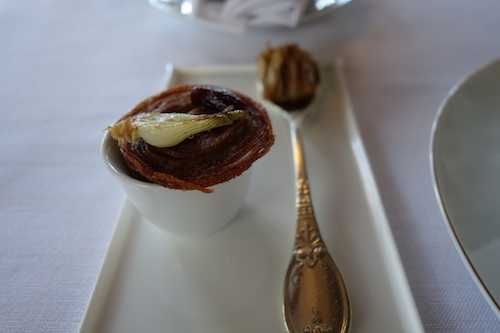 Keywords: modern & innovative cuisine, formal service, classically luxurious interior, a choice between courses on the lunch menu. 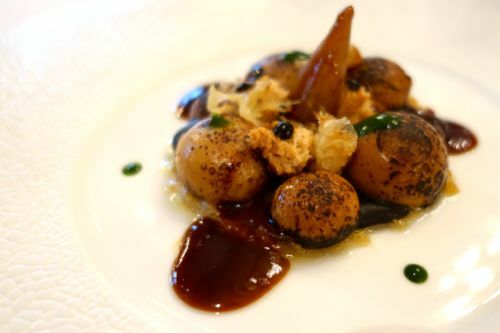 The cooking of Pierre Gagnaire, who is widely considered to be the most modern and boundary-pushing of the three-star chefs, is often brilliant, occasionally erratic, never dull. 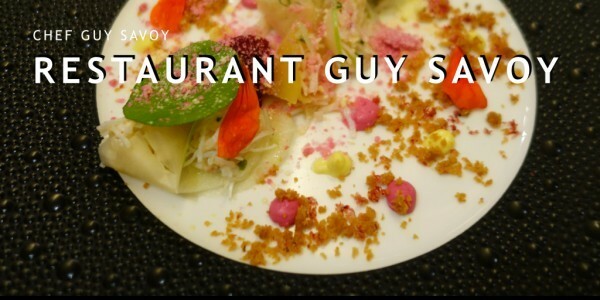 The playfulness of his food and the adrenaline spike provoked by the spectacle of so many individual tastes is counter-balanced by somber and anxious formal service. 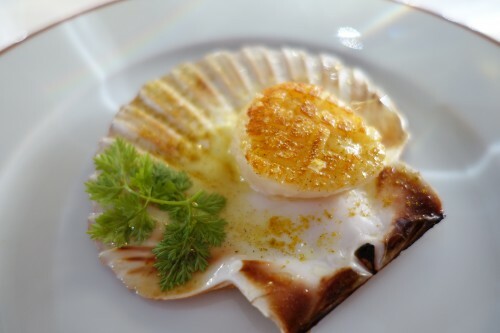 Cuisine: My favorite dish was a beautifully turned galette of Sarawak peppered sea scallops paired with an earthy Breton caillette and lapped with a consommé of sunchoke tapioca. 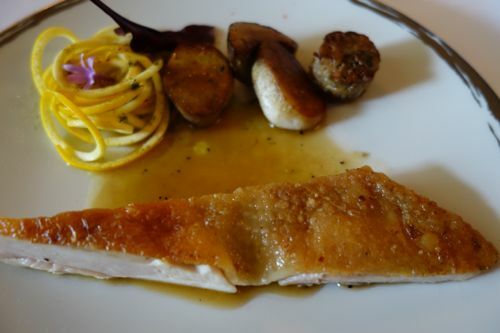 I also loved the roasted poularde presented whole and then carved into two different preparations – the breast dabbed with tamarind infused cooking juices and served atop green lentils with cabbage and turnips, the skin and leg meat served with a bitter purée of radicchio and hazelnut oil. 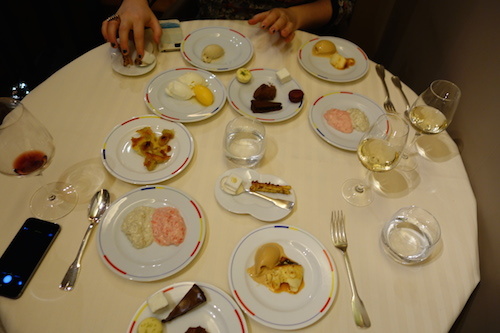 Dessert fans should note that fourteen different offerings make up the final act. 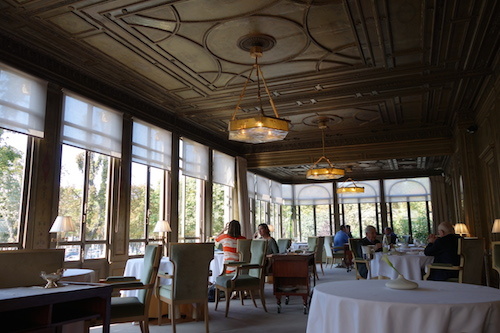 Service & Spectacle: The dining room is understated and contemporary, among the least beautiful of these three star settings. Servers are formal, joyless, and numerous. Scratch your nose and someone will come running, but don’t expect a smile. 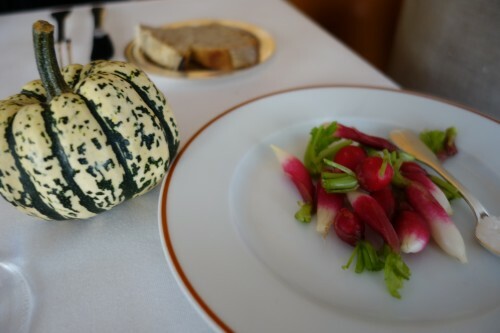 Chef Yannick Alleno is more discretely and effectively doing what his rival Alain Ducasse has been splashily purporting to do: celebrate vegetables, grains and fish. 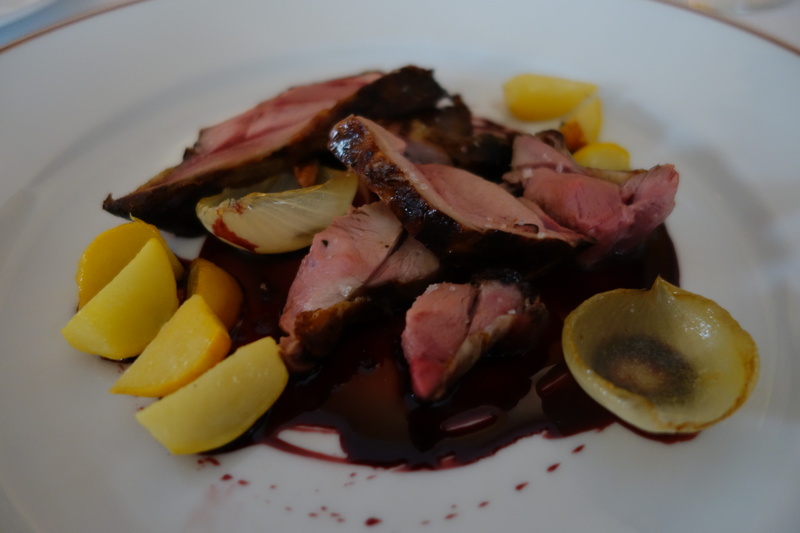 Aside from the delicious duck pictured above, the bulk of Alleno’s menu was rendered from humble ingredients: onions, potato, squash, mackerel, beer. And unlike that other Alain (Passard), his compositions feature more than one texture. Like Le Squer, this is a chef who is firing on all cylinders while all eyes are watching. Every rumor says he’ll retain all three Michelin stars, and I can’t think of why that wouldn’t be true. 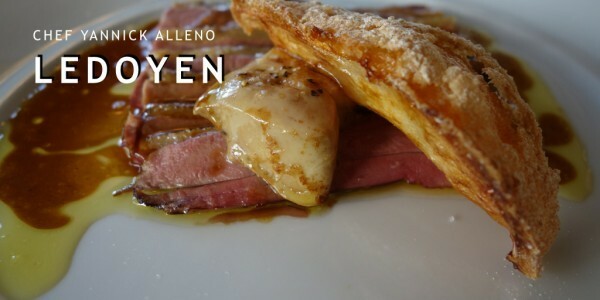 Cuisine: Alleno is updating classic haute cuisine with a renewed focus on what he considers to be the great strength of French cuisine –the sauces. 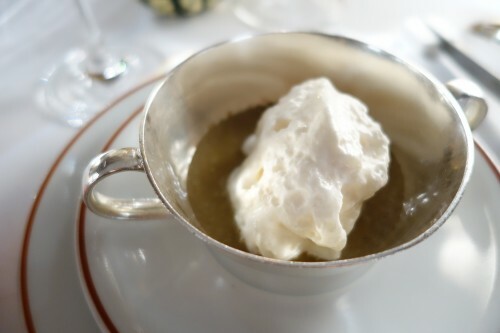 He’s using more modern techniques like cryo-concentration to magnify flavors and reduce the heavy reliance on butter and cream, but the compositions are still recognizably French. 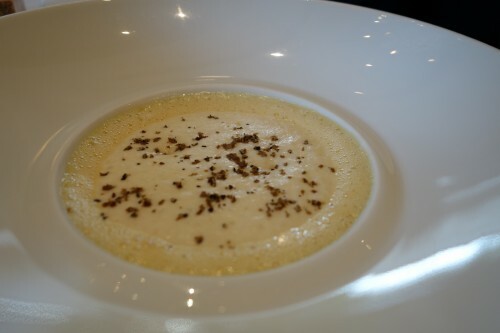 His starter of butternut squash, topped with crunchy seeds and accompanied by fermented bread mousse was a dish that I’ll never forget. Service & Spectacle: The oldest and most historic (1791) of these restaurants, dining during the day feels a bit like being perched in an elegant tree house with foliage revealed through three walls of windows. Service in the dining room was warm and professional. However, the biggest service gaffe of this project happened when Ledoyen almost failed to honor our booking. On the day of our lunch, the reservationist called me around 11am to say that we would need to come later than the original booking because I had failed to call and confirm. I explained that I had not been asked to confirm (as many other restaurants do require), but that this would not be a problem. When we arrived at the newly appointed time, she told us our table was not ready and directed us to sit in a dark corner at a table littered with coffee cups. Someone arrived soon after to offer us a glass of Champagne while we waited. We happily accepted and forgot all about the rocky start until the two flutes, amounting to €40, ended up on our bill. I had wrongly assumed these were offered as an apology for having given away our table to a(nother) journalist. It wasn’t a huge deal, and my overall rating of Ledoyen doesn’t reflect this blunder, but it’s a good illustration of the difference in treatment one can experience when visiting anonymously. 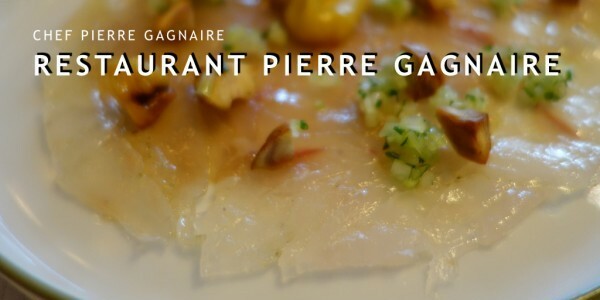 The most divisive of the three-star restaurants, Arpège is a place you’ll either love or hate. 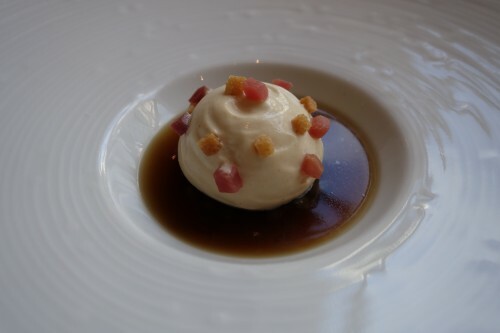 I’m in the former camp, through I acknowledge a worrying amount of repetition in Alain Passard’s tasting menu and the fact that his acolytes (David Toutain, Bertrand Grébaut) are working similar magic for a fraction of the price. 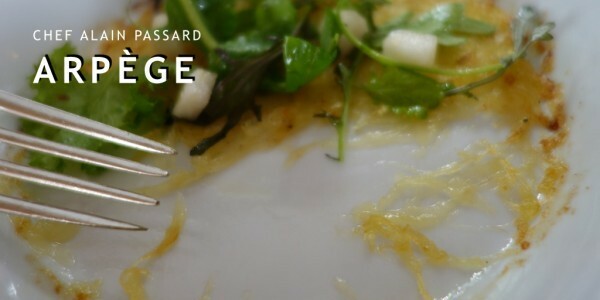 Before booking Arpège, ask yourself this: are you more likely to focus on the amount of pleasure that Passard can tease from an onion, or on the stratospheric markup of that ingredient? If you answered the latter, better to seek out caviar somewhere else. Cuisine: There seems to be more improvisation happening in Passard’s kitchen than anywhere else. 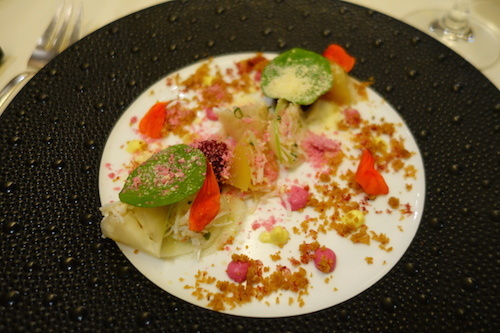 While certain vegetable dishes (the sushi, raviolis, couscous) have been a feature of the menu for years, plenty of other dishes (the sole with cabbage, the baby boar with turnips) seem to have been made up on the spot. 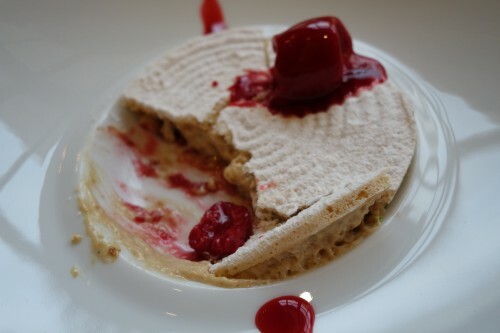 I tend to enjoy a spontaneous riff, but others might prefer to have more composed and perfected dishes. 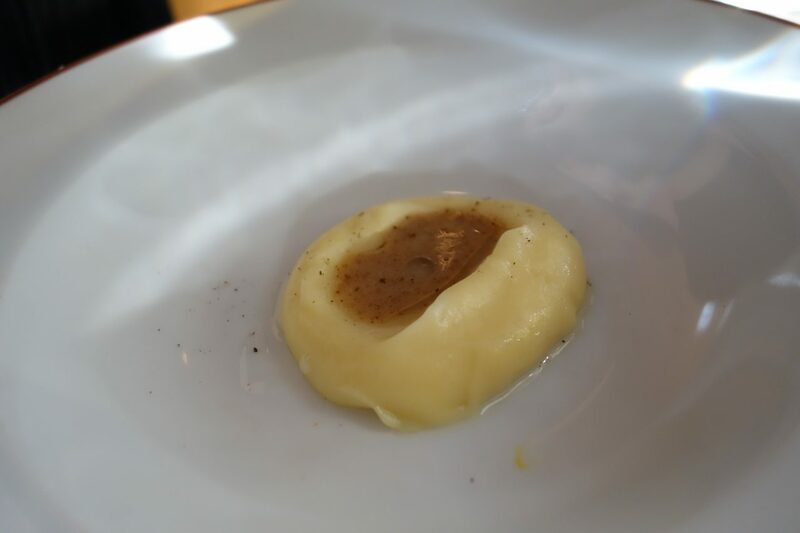 Passard’s flavors are easy to love, but his forms – purée after mousse after velouté, can get a little lazy. 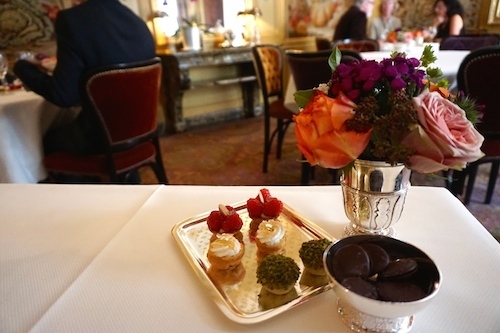 Service & Spectacle: The service is lovely – welcoming, complicit, and not overly formal. We loved the suggested wine pairings from our highly engaged sommelier. The room is… how else to say it… terribly ugly. It reminds me more of a conference center than a three star restaurant. If you’re looking for sparkle and show, this is not the place for you. Even if I can never afford to return, I’m so happy that L’Ambroisie exists. 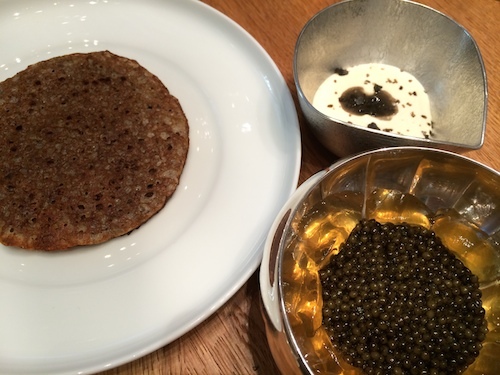 While many of his peers are shifting their focus to more modest ingredients, Bernard Pacaud is still laying on the caviar. 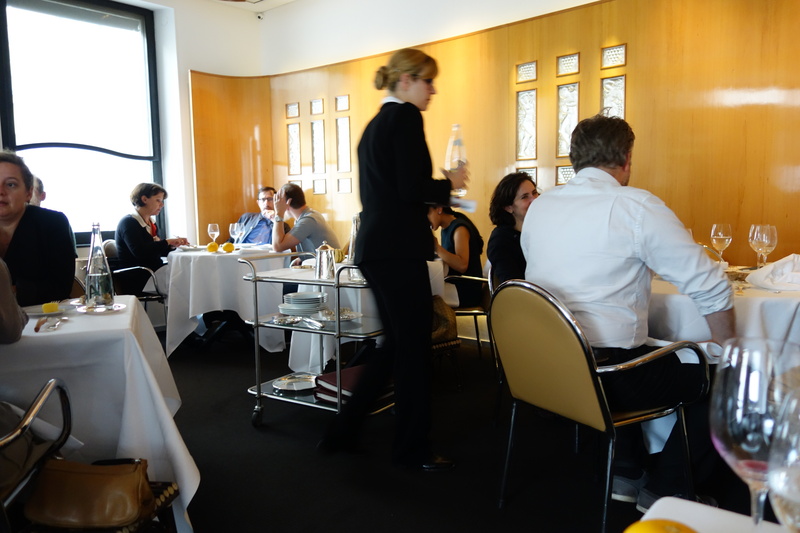 While service elsewhere has become increasingly solicitous, L’Ambroisie remains a model of aristocratic snobbery. I’ll be sad the day their sumptous dining rooms close for good, and will treasure the memory of a meal I only partially enjoyed in the moment because I was mostly holding my breath. Cuisine: In terms of classic haute cuisine, this is as close to perfect as you’re going to find. 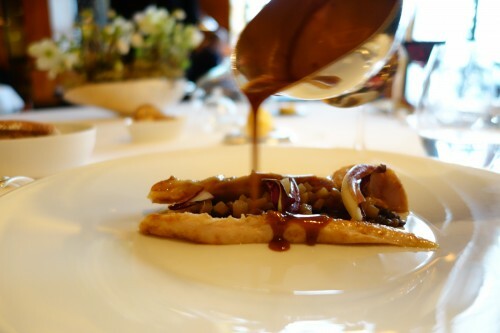 Expect luxury ingredients, fattening sauces, and to take a nap after lunch. 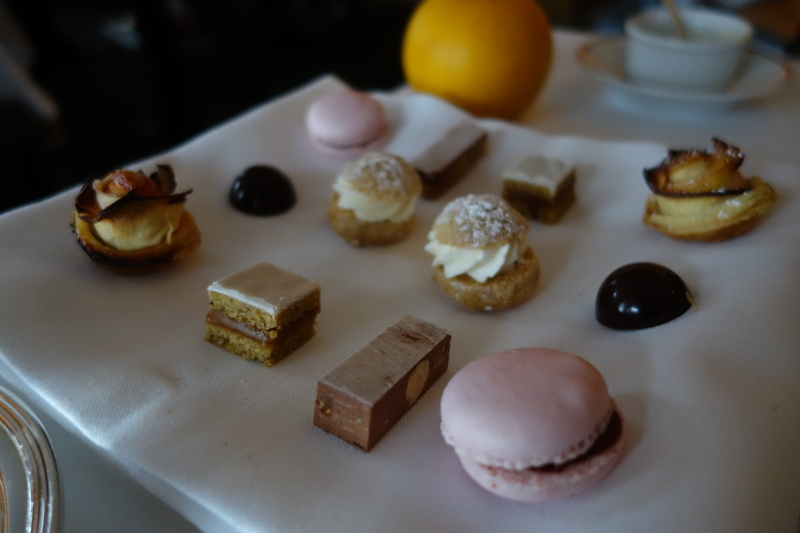 Courses are not padded with an extensive array of snacks and sweets – you’ll be offerend some gougères, a spoonable amuse, and will finish with one compact tray of mignardises. 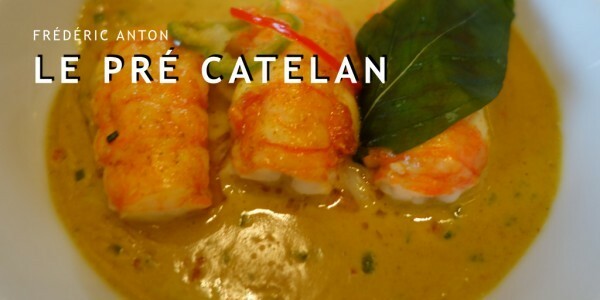 Everything else is à la carte and thunderously expensive. Service & Spectacle: The dining rooms here are devastatingly beautiful, evoking a private aristocratic residence in the place des Vosges. Service is similarly undemocratic. Our sommelier warmed toward the end of the meal but only through the dedicated efforts of my professionally charming lunch companion. Unlike Adam Goldberg, I don’t know that I need to return twenty times to this restaurant. Apart from the company, it wasn’t particularly fun. Price of lunch menu: exclusively à la carte at both lunch and dinner. 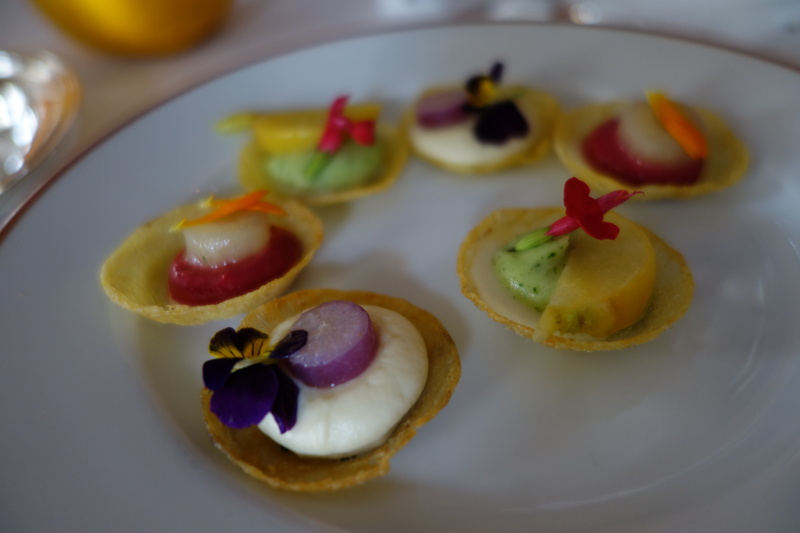 The average price ordering three courses per person was €320. Wine: paltry pairings available by the glass (a handful of options listed next to the soft drinks on a laminated menu). You want to order a bottle here. The sommelier advised a 2011 Pouilly Fuissé Sécret Mineral 2011 from Denis Jeandeau for €130. 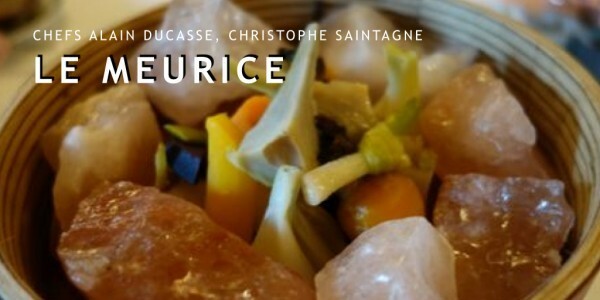 Of all the restaurants reviewed for this project, the place I’d most like to become a regular is Astrance. 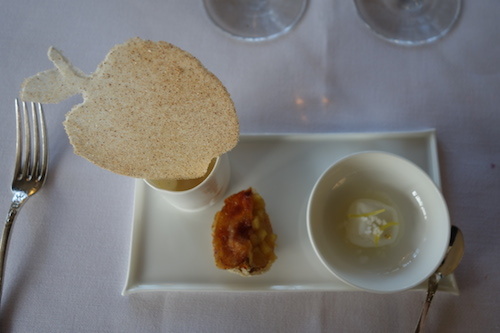 That’s largely because of the service, including the wine pairings, which were by far the best I experienced. The food, while delicious, was less ambitious than I expected, but the price at lunch makes this the best deal in town. 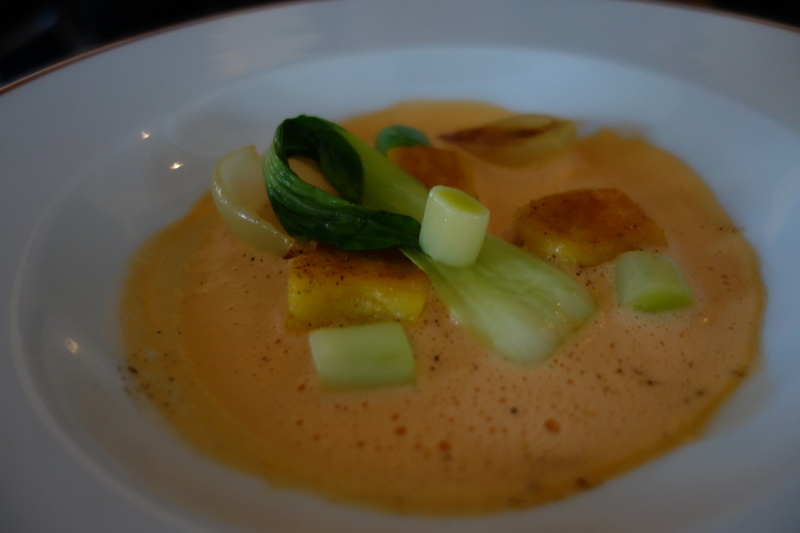 Cuisine: Pascal Barbot is often placed in the same modernist camp as Pierre Gagnaire, but I find his Asian-inflected cuisine to have more in common with William Ledeuil from Ze Kitchen Galerie. 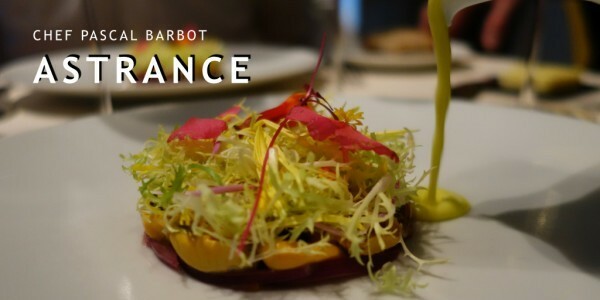 I’ve never had more perfectly cooked mussels or fish, but Barbot’s unchanging reliance on lemongrass, basil & mint, not to mention his immortal tarte of foie gras and mushroom, do not bolster his reputation as an innovator. I would still be thrilled to return. 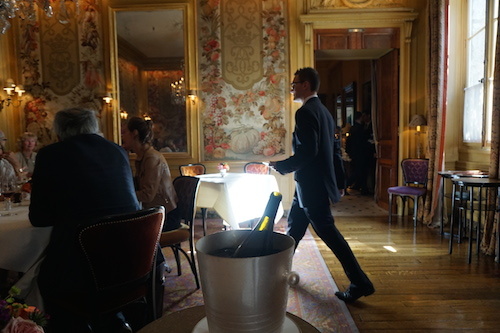 Service & Spectacle: The small number of tables are well-cared for by a handful of jovial, welcoming and highly engaged servers led by Christophe Rohat. 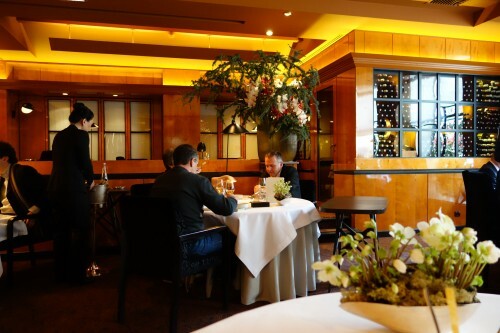 This is a modern dining room devoid of silver trays and rolling carts, so don’t book Astrance if you’re expecting a pedestal for your handbag. 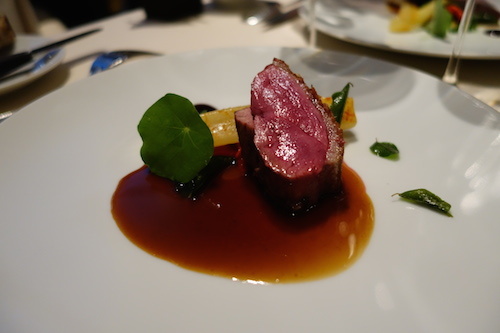 The most successful and enjoyable wine pairings of any three-star restaurant, by a large margin. 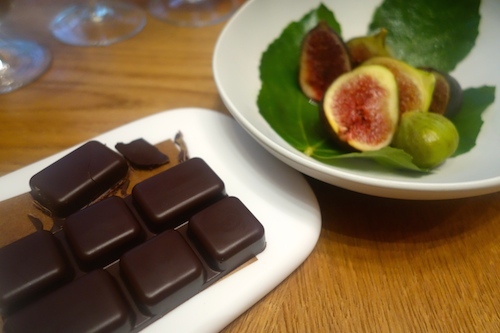 Wine: an additional €50 per person (€120 in total) for a pairing with each course, including a glass of Champagne plus water and coffee. 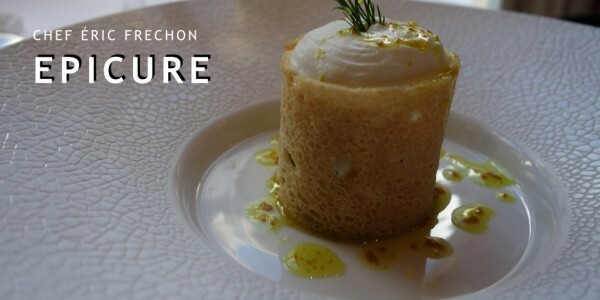 Chef Éric Fréchon and his restaurant Epicure have a lot of fans, so I was expecting something great. The cooking, while enjoyable, didn’t offer anything new. The setting lacks soul. 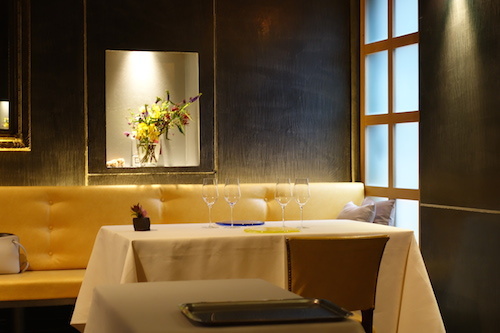 It occupies a very similar niche to Le Cinq but doesn’t measure up. Cuisine: There was so much potential here, but Fréchon’s cuisine plays it a little too safe for my taste. 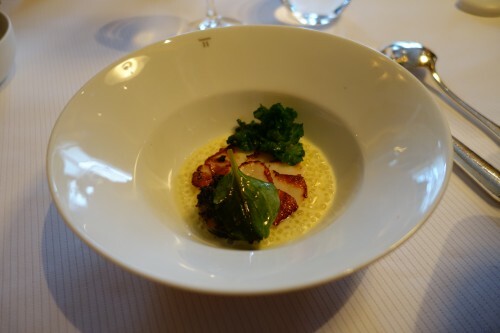 A dish of raw sea scallops with oyster juice and lemon curry cream delivered no brine and very little spice, tasting mostly like shellfish and cream. 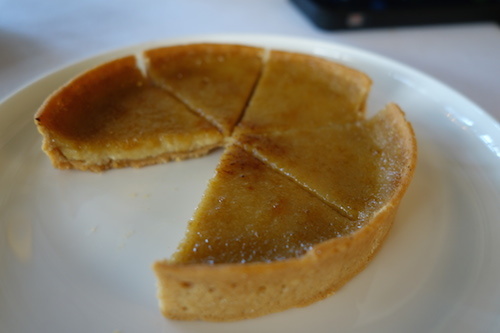 Harmless, but lacking any of the power that Le Squer could have brought to the dish. Desserts were cloyingly sweet. 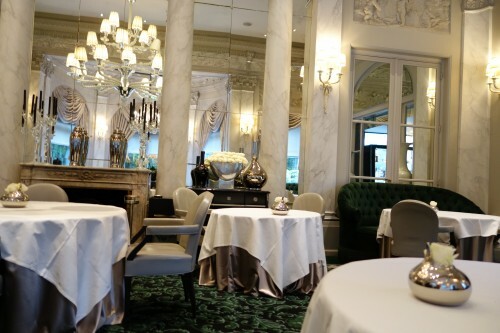 Service & Spectacle: Aside from the stunning floral arrangements, I found the dining room in this luxury hotel to be quite dated, almost provincial in its mix of heavy curtains, plaid chairs, and heavy crystal stemware. 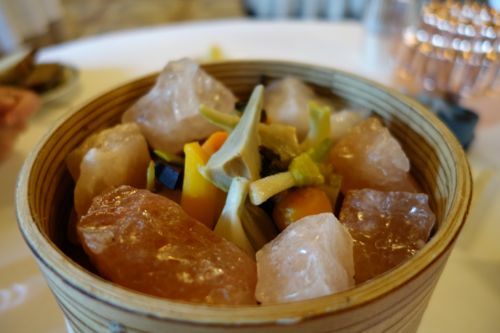 And while my inner child appreciated the rainbow crystal butterflies that decorated every table, it seemed a very twee choice for a gastronomic restaurant. Service is formal, with competent staff and an abundance of rolling carts. 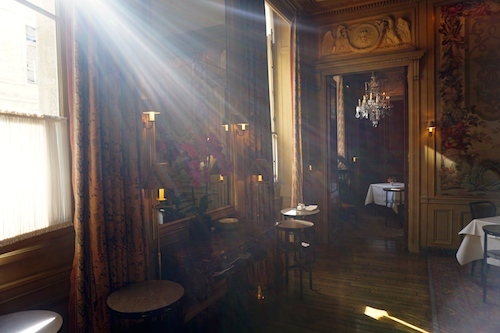 Go for the palace setting – the chance to dine in that glittering stunner of a room. 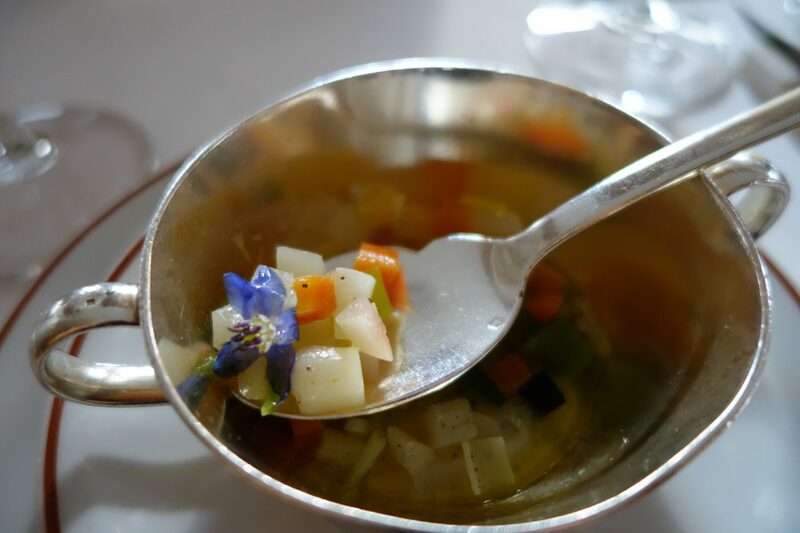 The feeling of stepping back in time will last through the apéritif until a kooky fondue pot of steamed vegetables arrives and you remember that you’re in a modern Ducasse restaurant. 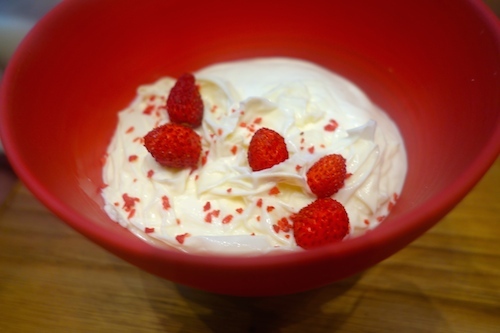 The jovial service will smooth your rising hackles and allow you to enjoy one of the best desserts in town even though the main course nearly put you to sleep. 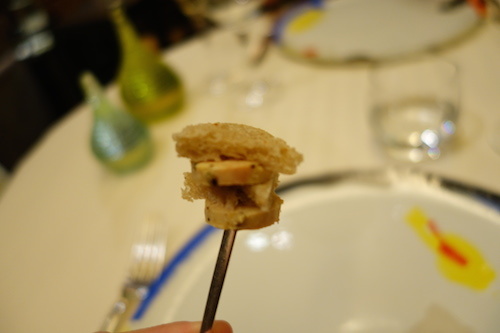 Cuisine: Tuna with smoked eggplant, chicken with mushrooms… just wake me up when the sorbet cart arrives, ok? 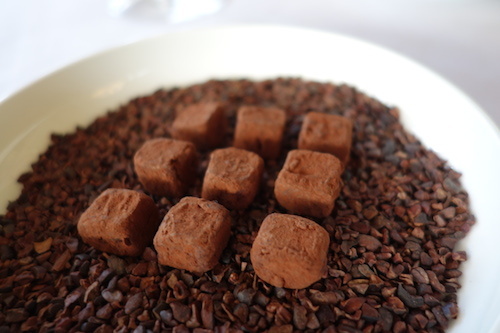 That and the dessert that followed – chocolate from Ducasse’s own manufacture in variety of different textures – let us finish on a high note. 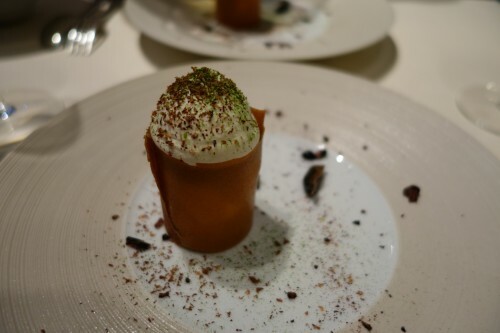 Service & Spectacle: While the food may not be mind-blowing, the service and setting certainly are. There are plenty of people for whom food is not the priority. 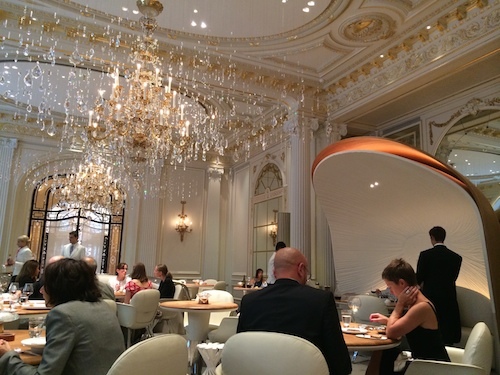 They will enjoy Le Meurice more than I did. 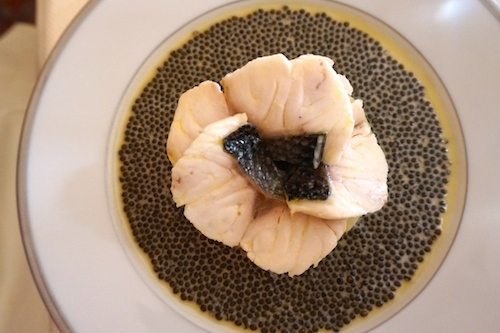 I think it’s wonderful that Guy Savoy is committed to offering more modestly priced lunch menus to attract a wider audience to haute cuisine. The introductory greeting, which was delivered without variation to every table in our small cubicle of foreigners, was perfectly calibrated to welcome first-time explorers, including the line “this meal is designed to take two hours and fifteen minutes.” I do suspect, however, that the quality gap between what’s delivered in his starting offer and his pricier menus may be wider than in any other restaurant. 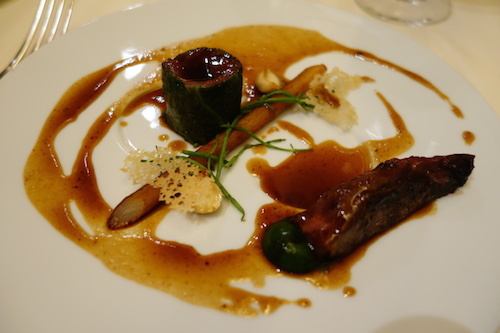 Cuisine: A dish of pigeon with salsify was delicious. 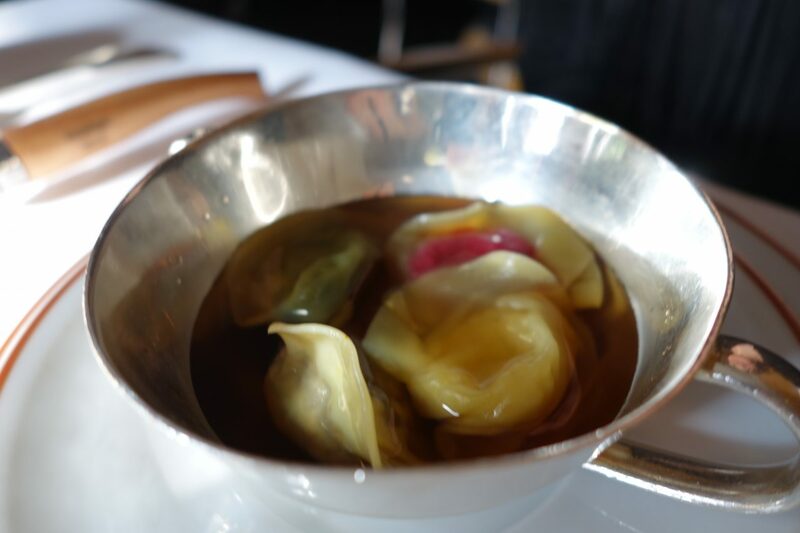 A technicolor starter of turnip petals stuffed with crab was garishly overdressed (photo above), resulting in a plate that looked to one of our Instagram followers like the result of a sneeze. Two other dishes were completely forgettable. 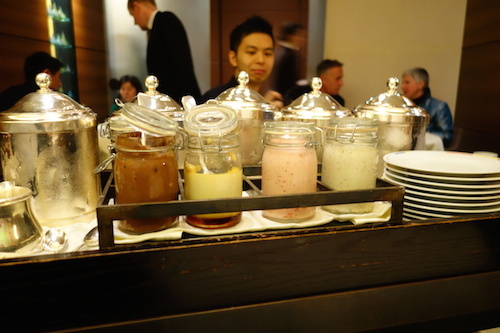 The array of spoonable foods on the dessert cart, while sure to delight many, made me feel more babied than pampered. 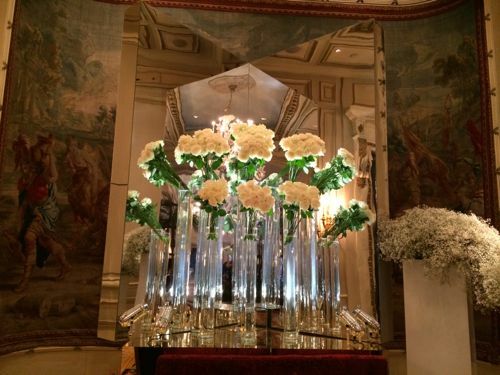 Service & Spectacle: It’s not worth talking about the setting since Savoy will soon be reopening in a new location in the historic Monnaie de Paris (March 2015 or later). 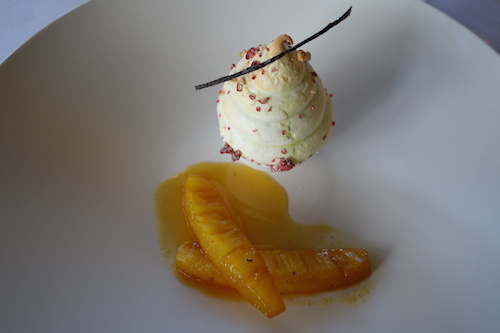 Service is professional and highly attuned to the needs of diners who have less experience with three-star dining. I would trust them to make anyone feel at home. Wine: five different wines, including Champagne to start, were included in our autumn menu (plus water and coffee). 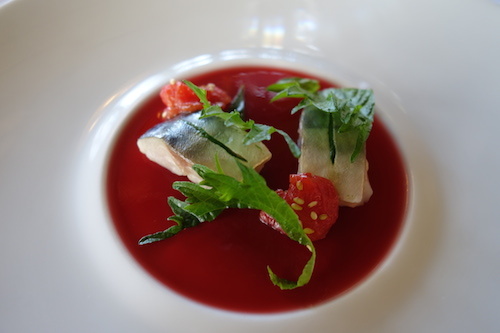 A beautiful path through the Bois de Boulogne leads you to the restaurant of chef (and Masterchef star) Frédéric Anton. It would be rude to suggest that it’s a road to nowhere, so I will simply say that I don’t understand the attraction. 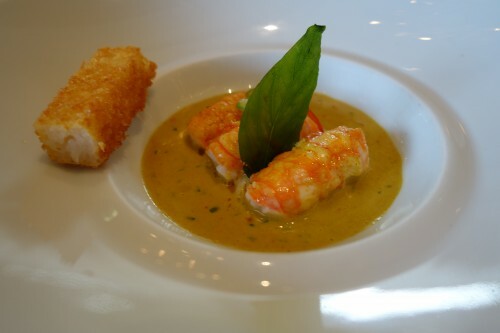 Cuisine: A starter of curried langoustines lacked any punch and the array of accompanying fried bites added steps but not sensation. 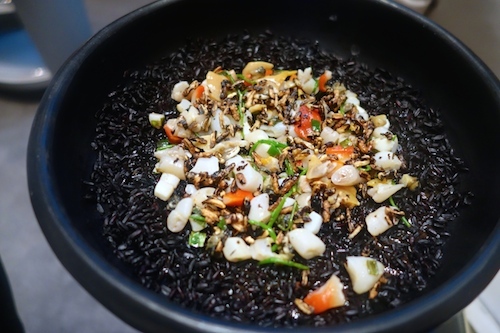 A main dish of squid was divided between two deep bowls, one part fried and the other half sautéed with tomato and topped with fried onion. I was half expecting this to be followed by jalepeño poppers and mozz sticks. 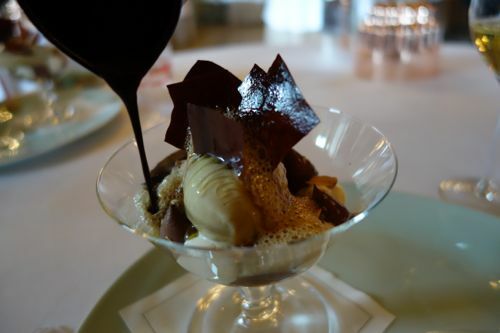 Desserts at the Pré Catelan are reputed to be outstanding. They were fine. It should all have been so much more than fine. 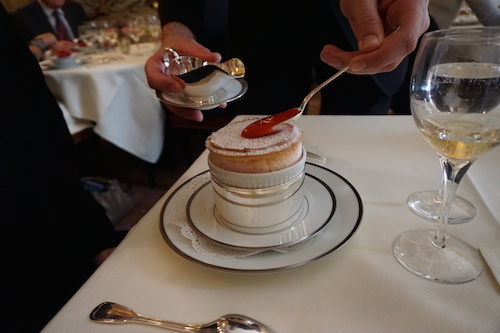 Service & Spectacle: As with Ledoyen, L’Ambroisie and Le Meurice, there’s a feeling of stepping back in time. 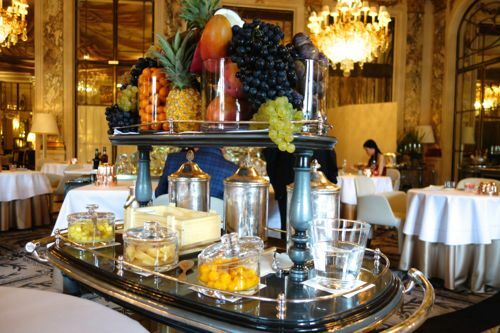 Rolling cart service for Champagne and cheese, marble columns and chandeliers, formal and competent service. The most egregious example of naked Emperor syndrome that I’ve ever encountered. The lobster dish pictured above, plus a starter of caviar and cream (can’t mess that up) and some delightfully bitter citrus desserts… these were the only compositions during two different meals that I genuinely wanted to finish. Service was scattered and surprisingly amateur. This would have been my least favorite experience even if price were not a factor. 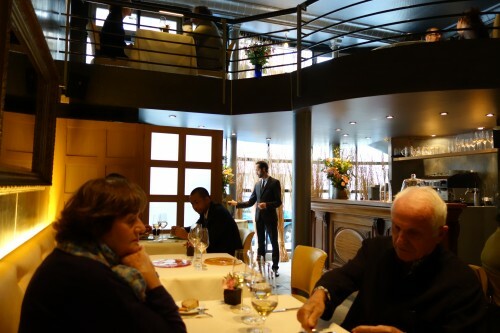 But considering that a meal here costs between 2-5 times the price of any other three-star (excluding L’Ambroisie), the utter failure of ADPA to deliver a satisfying meal is cause for alarm, as is the failure of other writers to report it (read more on Ducasse’s invitations and our own free meal here). 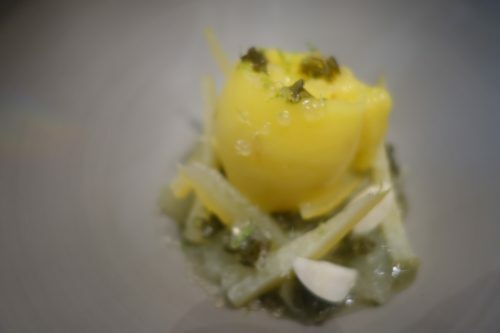 Cuisine: As I mentioned earlier about my personal preferences, I’m all for elevating modest ingredients and turning the focus away from foie gras and caviar. 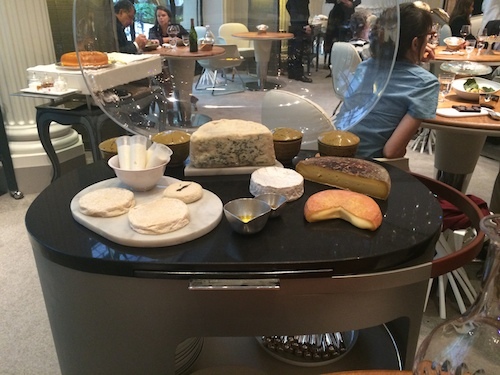 I’m a fan of Arpège and Ledoyen, two restaurants that are making similar and more successful efforts. 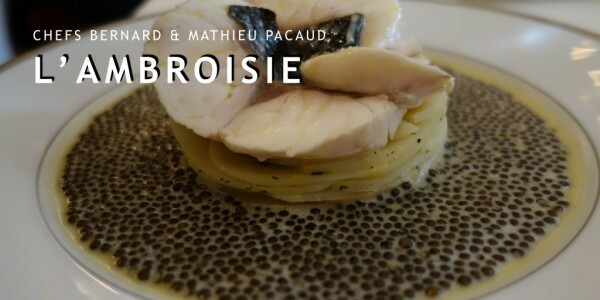 However, the highly mediatized “naturalité” campaign by Ducasse has resulted in some of the most dreadfully boring food I put in my mouth this year. 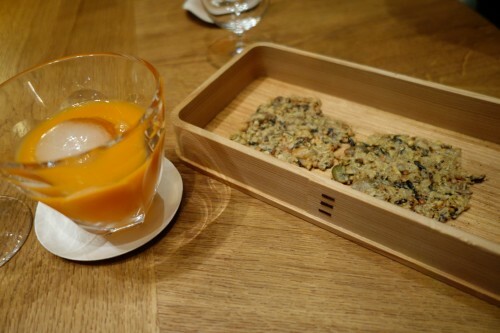 The seeded cracker and juice that greeted us felt like an after-school snack. 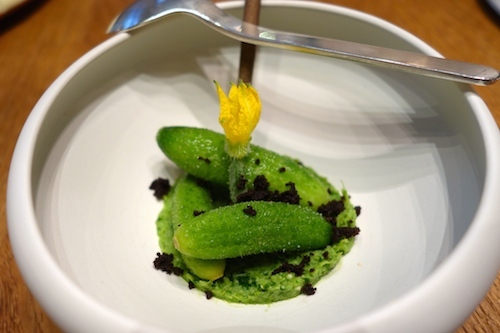 An amuse of cornichon with black olive failed to do its job. A flaccid rectangle of sea bass swimming in a pool of bile colored sauce was mostly left uneaten. 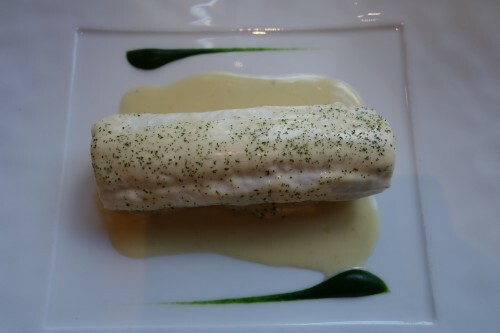 It was followed by a different white fish in a different green sauce. Neither had any salt, acid or textural contrast. 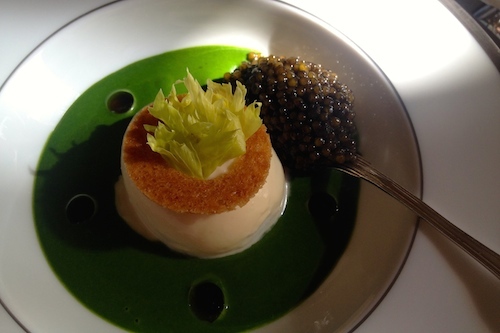 Reviewing my photos and describing these dishes actually makes me furious. How could anyone recommend this? The sweets were good, I’ll give them that. 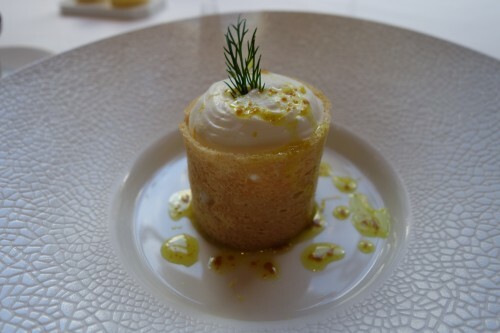 For someone who appreciates (and is increasingly) bitter, the lemon, algae & tarragon dessert was a delight, as was the citrus with Campari granita. 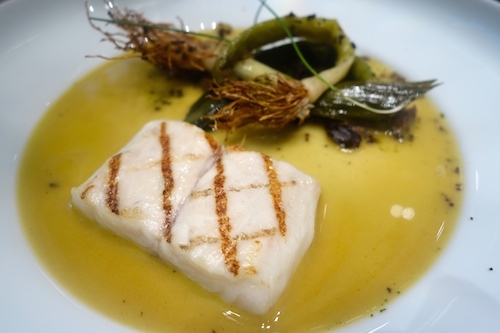 ADPA: sea bass with leeks & black olive. 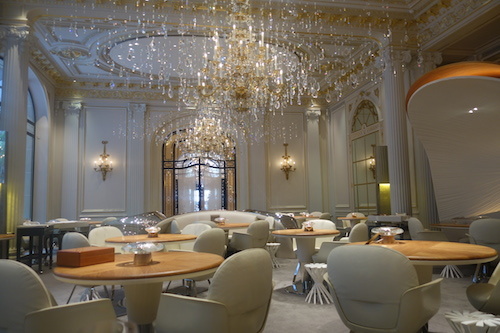 Service & Spectacle: The setting, with its deconstructed chandelier and shiny silver round dining pods, is enchanting. One of the most spectacular dining rooms I’ve had the pleasure of eating in. The service was kind, but full of errors. 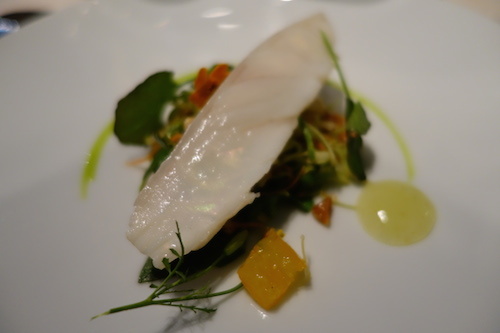 To accompany this menu of vegetables and fish, we requested recommendations for different white wines by the glass. Our wine server (not the head sommelier) brought me a white Hermitage, and when I asked him to remind me of the cépage, and he told me it was a base of Grenache, Syrah and Mourvédre. I smiled and asked if he was sure (those are southern Rhone red varieties); he was adamant. It was deflating that he seemed to not think highly enough of us to bother correcting himself. 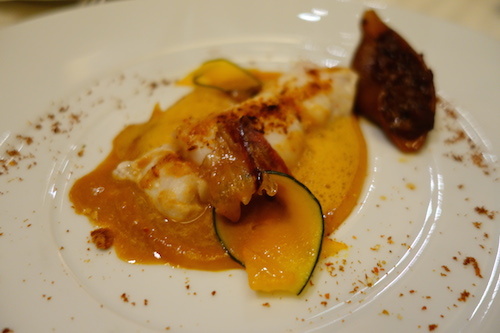 The pairings that followed were two different red Bordeaux – poor matches for the fish, contrary to what we had requested, and more expensive than anywhere else. This is just one example the amateur service at ADPA. There are more, but I think you get the point. 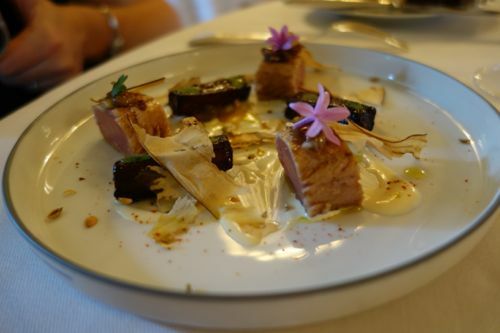 My wife and I dined at L’Astrance in June 2017. Things went bad already two days in advance, when I called the place (from abroad) to confirm the reservation, which was made in very early April. It turned out that they put us down for the next day, for which we already had other plans. We had no choice but to accept. I will be brief about the food. 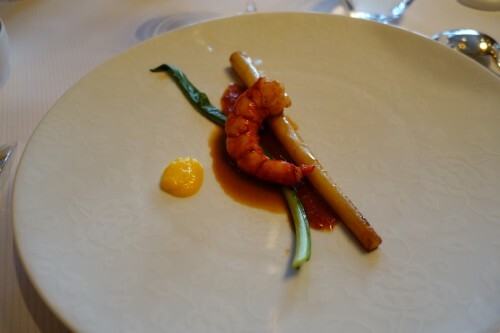 It was OK, but for a Michelin-starred restaurant – well below expectations. 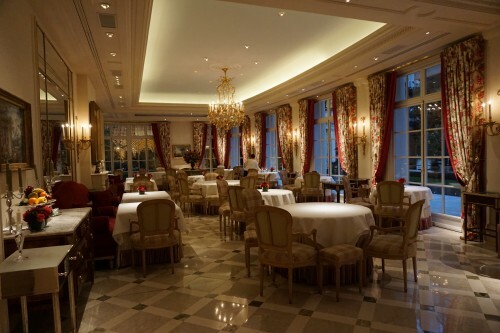 We have dined in a few 2- and 3-star Michelin Paris restaurants so we can compare. 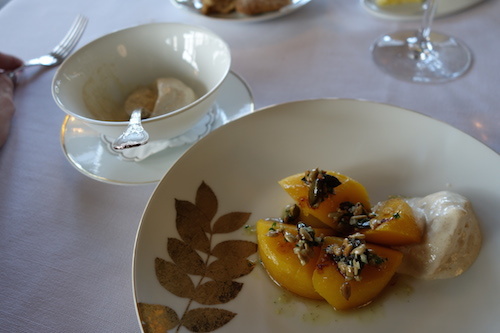 Certain dishes were just dull (e.g., the dessert). What was outright bad was the service. 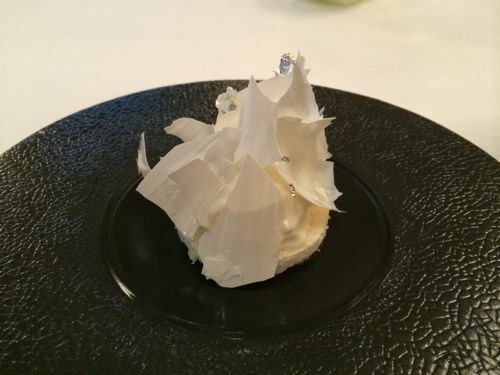 Butter was served on a badly-chipped plate (really, a corner was missing) and we had to insist on having it replaced. At certain points the waiters were rude and/or arrogant. There was an error in our check, to the tune of Euro 120, and so forth. Simply unbelievable. After paying, we asked to speak with the shift manager – a guy named Christophe – and mentioned some of the issues. 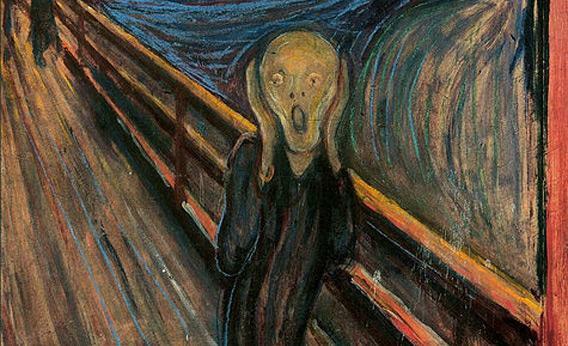 All he had to say was that next year they might start using email for reservations. Throughout, there was never a single word of apology or even a hint of taking responsibility, let alone any attempt to appease us for the frustration. 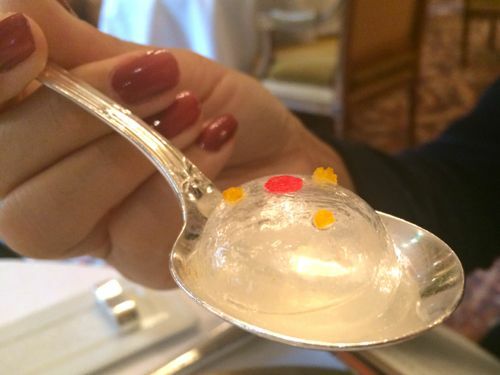 Guy Savoy continues to be the most overrated Paris restaurant. Your comments were right on. The service is arrogant and deplorable as was the food. Amazed that people still try it after so many scathing reviews. An interesting read. I shall try L’Astrance finally after your piece. L’Ambrosie is my local when I stay at my apartment but apart from rocking up once at 10:00pm on the off chance with friends who could afford it, I’ve still to eat there. Just needing a disposable windfall? Thank you for an informative, entertaining and – for us – timely post. 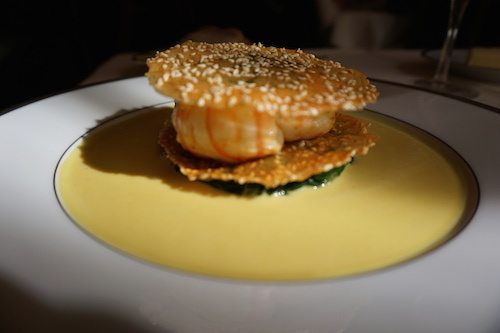 My wife and I are visiting Paris in May and are researching one or two 3* restaurants for lunch. Astrance was already on the list but so was Le Pré Catelan. Time for a rethink! Thanks again, this is an outstanding blog! Ironically, I think what this article has succeeded in doing is convincing me not to go to any of the 3* places in Paris. I am happy to pay a great deal for an experience, but I prefer it to be a good experience. I personally have not eaten at ADPA although I would have liked too. However your reviewer has significantly put me off attempting this on my next trip to Paris. 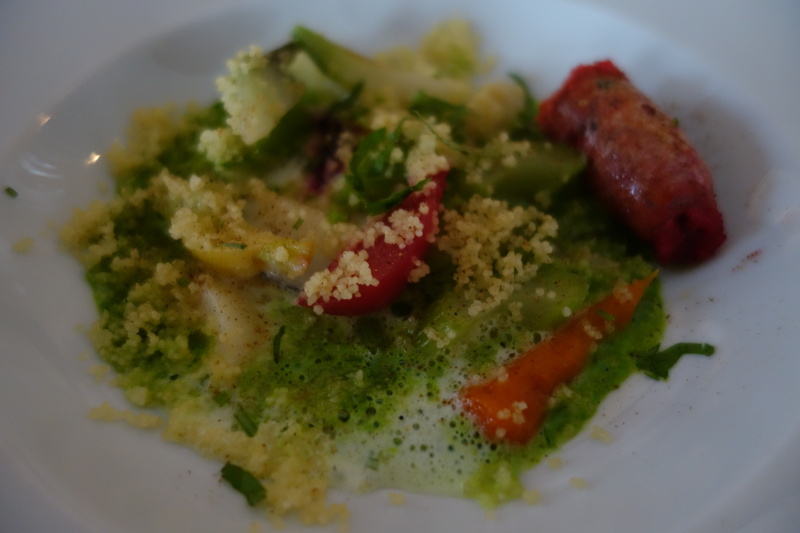 The compositions of dishes do not sound a success and flavours seem lacking by all accounts. 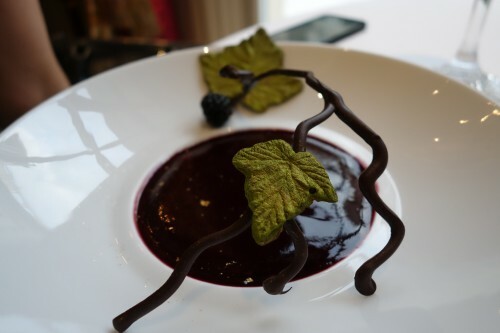 One of the dessert photos look as though it has been put together by a child at kindergarden(red bowl seemingly dotted with berries..) and one asks has Alain Ducasse got too big for his boots? has he lost the plot? This is a terrific series! It also super that the wines are taken fairly seriously. I love to story from JP above. I would have thought they should have given you the wine as you were right! Not all sommeliers are so bad. I went regularly to a nice restaurant in Philadelphia (The Fountain). Once we followed the recommendation of the somm for wine 1, then wine 2 was OK but not nearly as good. He said: Do you want another wine 1, I’ll drink wine 2?” Now that is good service! 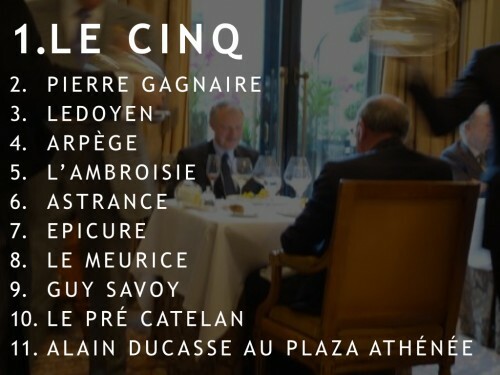 A very interesting list as two of those restaurants I would NEVER go to again: Pierre Gagnaire and Guy Savoy. And not for the price, but for the experience. At PG the Sommelier tried to force a TCA tained bottle upon us. We declared it flawed upon first sniff, he insisted we didn’t understand the wine. We explained that we were at the winery the week before, had this exact wine, and this bottle was flawed. 20 minutes of discussion. We finally offered this: open another bottle, if it is the same, we buy both. If it is not, we only buy the good one. The 2nd bottle was magnificent, and he walked away from the table with the TCA bottle. This is not a unique experience as two friends of mine went back years later, not knowing this story, and had a similar experience. 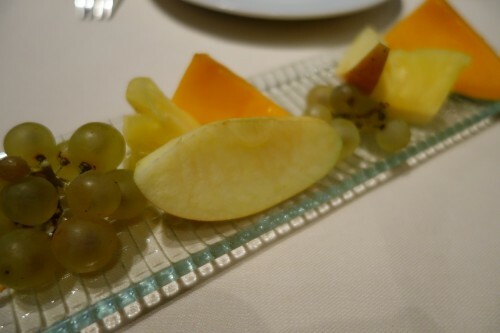 Too bad as the food was GREAT, fun, playful, inventive…. we laughed and laughed through the meal is was such an experience. But not being able to trust the sommelier, not having him listen to us, or acknowledge a TCA bottle, is more than enough to not go back. And at GS everything missed. Bad timing of the dishes, some cold dishes that were supposed to be warm, bad service. Thank you for your really enjoyable and informative reporting. 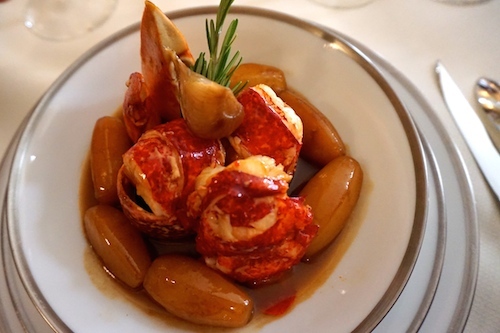 Might it be more accurate to title your study “Our Favorite Three Star Lunches in Paris”? It seems that lunches – and particularly set-lunch menus – can diverge significantly (or completely) from the dinner options. 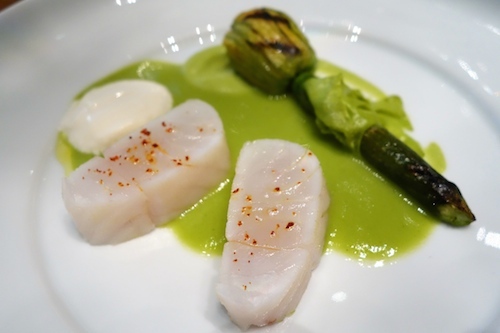 Sometimes the best plates might only be a la carte as well. I cannot thank you enough for this list. Despite having eaten at a lot of Paris 3-stars, I had no idea there was such a price discrepancy. 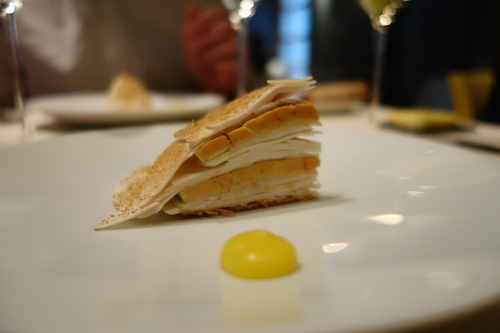 You have listed something for everybody…but I am a little puzzled by your throwaway line which had Manresa, Mugaritz and Noma in the same sentence…not sure where you were going with that, but just have to say, even tho’ off-topic, we’ve been to Mugaritz twice, and it is a total rip off (should have learned the first time, but oh well.) 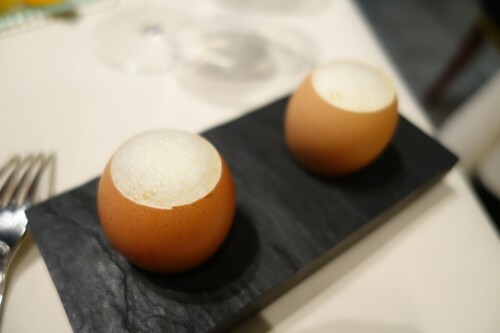 Manresa is near and dear to our hearts, literally and figuratively, since we only live 45 minutes from it, and adore it, and its always creative cuisine. Hi M. Lane – I’m so glad you enjoyed both the food tour and your meal. We loved having you. 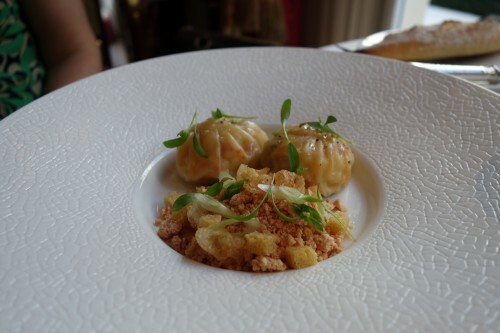 Hi chefhermes – Our aim wasn’t to evaluate whether these restaurants meet Michelin’s own criteria for 3 stars (let’s leave that to them), it was to follow Michelin’s recommendations for what restaurants merits a special journey (***) and then describe what they are like for our own readers. Because the decor and service are, in my opinion, what sets them qualitatively apart from other restaurants, I thought they were important to describe. I also wanted our readers to know that there are significant differences between the less formal setting and service at Astrance vs. Le Meurice and to let them decide for themselves if that mattered. Regarding this “claim to be first,” I said in an interview elsewhere that I wanted to review all the three stars within a single season to provide a snapshot of what they are are like right now, and to draw comparisons while the experiences were still fresh in my mind. I’m not interested in being competitive with Andy Hayler or any of the other writers whose work I admire. Mine is just an additional viewpoint to add to the mix. A very interesting post and very useful as well. 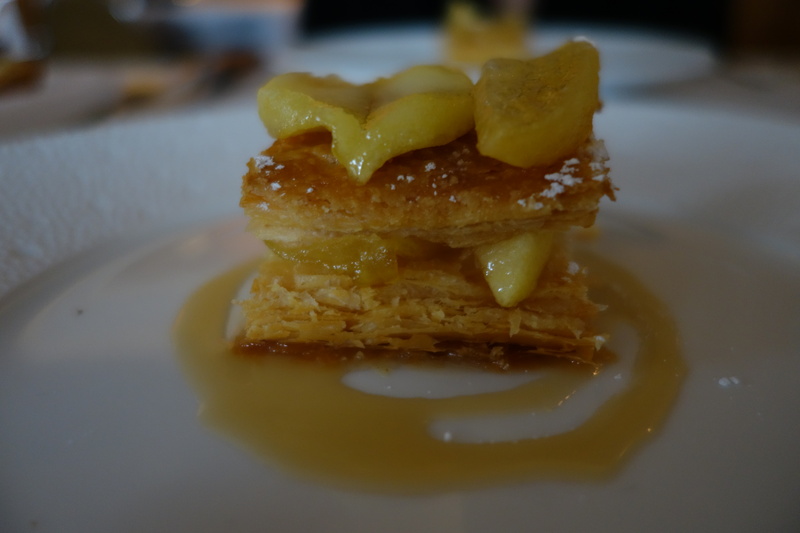 On my only visit to Paris [so far!] I decided to book only two food experiences before I arrived. 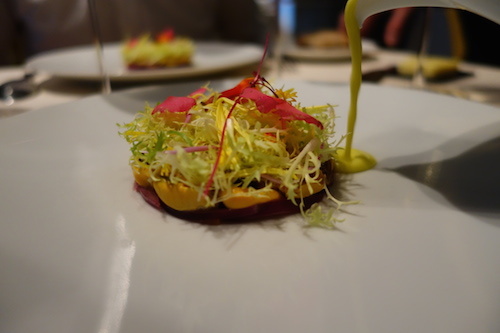 One of your tours and dinner at Taillevent. Both were perfection. 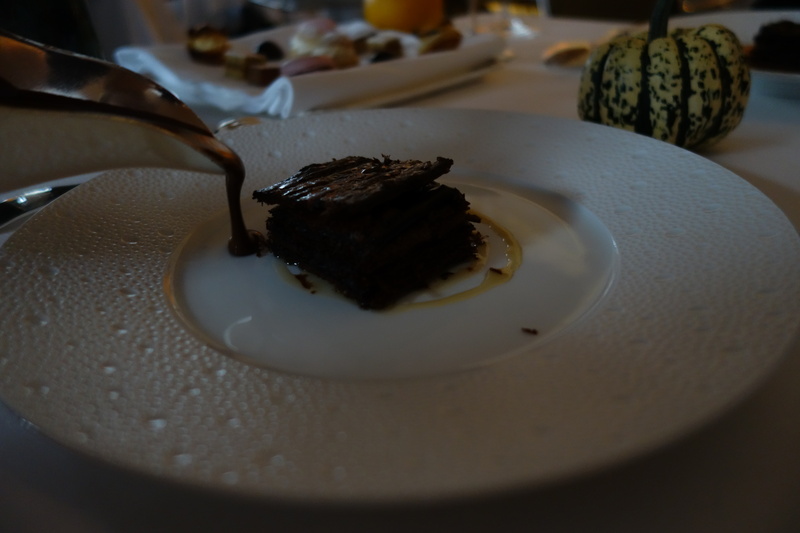 I could only afford one evening of dining without regard to the cost and Taillevent reigns as the best dining experience of my life. 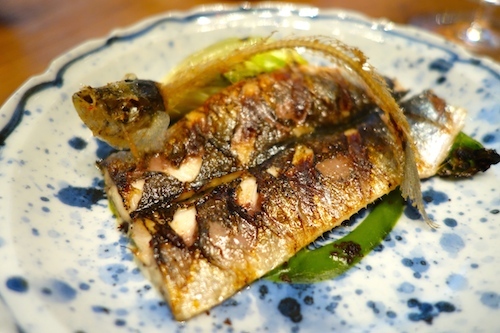 Thank you for the information in this post which included one restaurant I had on my list for a return trip. 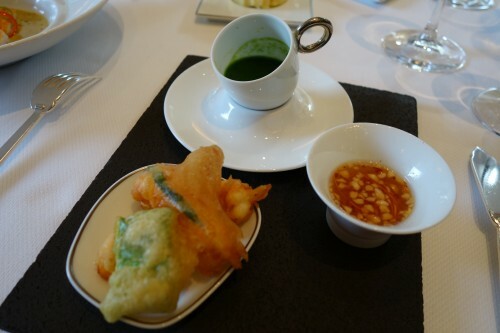 Whilst as a guide about high end restaurants it’s quite a nice piece, it really does miss the mark of Michelin. There is a constant reference to decor & surroundings, yet Michelin themselves have said on numerous times that a star rating has nothing to do with that. 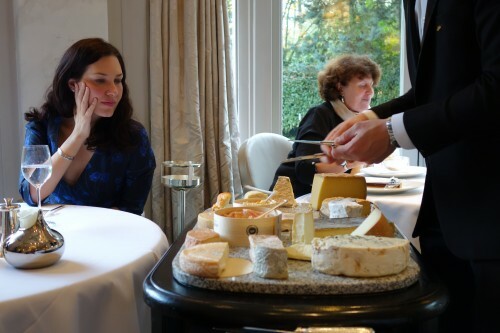 According Rebecca Burr Editor @ Michelin UK it is solely about the food & nothing else. It’s also nice to see that you’ve dropped the claim to be the first to dine in all of Paris’ 3* restaurants. An ambitious claim, but false, you only have to Google ‘Andy Hayler’ to see that you are far from the first.